Here’s the deal: It’s an experimental game in the sense that I’ll be creating it based on everyone’s suggestions! 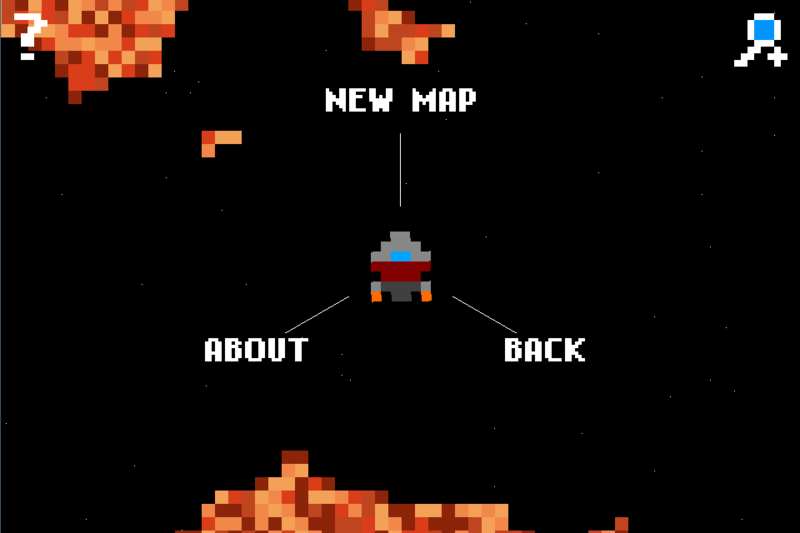 So far it’s just a little rocket ship that you can fly around a randomly generated map in a blocky 8-bit style. That’s it! 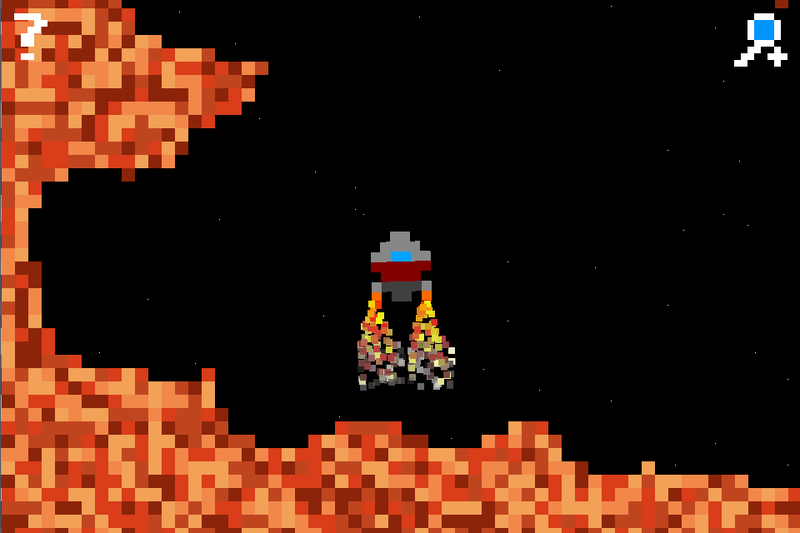 As people send in ideas for the game, I’ll update the game on the AppStore. I’ll be trying my best to release weekly updates to show off the progress of the game… and if you send me a suggestion for the game I’ll add your name to the credits! Anyone that buys the game now ( when it’s free ) will get free updates for life! Once there is actually a true game I’ll bump up the price to an outrageous $0.99! If you don’t pick it up now you’ll have to start saving your pennies! Why do this? I think it’ll be fun! I’ll get to hear all your wacky ideas… and better yet: I’ll have to try to implement some of them! Plus, you guys will get to shape the game however you want! Who knows what it’ll turn out to be! Ok, go get Rocket Bits and start sending me ideas! I love the concept of a game that develops according to user feedback! Here is my suggestion: I think it would be awesome if this became sort of a space adventure game with some “Minecraftian” elements. For example you could fly around in the ship and land on various planets. Then you’d use the ships drill to mine for resources/ parts on the planet to upgrade your ship and build things like space stations or colonies. You could also have aliens that would come and attack your ship. Minecraft is awesome because it gives you a sense of surviving, gathering, and creating and I’d love to see this game go in that direction. Hi Wallaby! Great suggestions! Creating an environment where the player can explore and adventure through is definitely a direction I’d love to see the game go. I especially like the idea of building space stations and colonies. A co-worker had a similar idea when I was first starting the game and we thought even a little “micro RTS” style game similar to Tiny Tower would be really fun! Maybe you drop off a little guy to colonize an area and have to bring back different resources for them to stay active building their cities and fighting off aliens? Thanks for the ideas! I’ll add your name to the credits for the next update. Speaking of credits: do you want “Wallaby” in the credits or something else like your real name? Wallaby is fine thanks a lot! What of your in-game character actually was the little man? Then you controlled him while he was on the planet gathering things, fighting aliens, etc and that way it would actually be you the player performing the actions of the game instead of the computer. Then moving from planet to planet would be a big deal because you’d have to be done with the first one before moving on, or else be prepared to multitask. I’m very excited to see how the game develops, thanks for making it! When is the next update? Yea, totally! 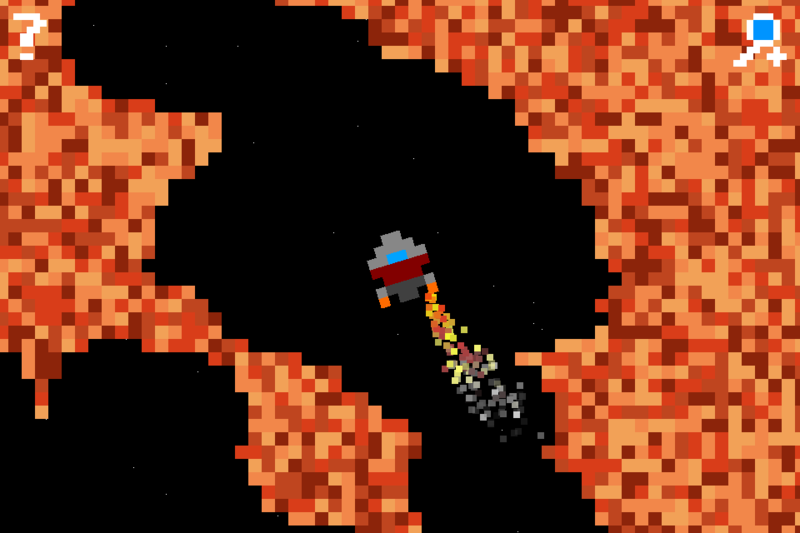 I was thinking the little space man you control would have a real “floaty” feeling since it’s low gravity. And maybe you have a limited amount of oxygen supply before you need to get back to the ship? I’m going to try to do updates as often as possible. Ideally ever week, but that might be a little tough considering the review process on the AppStore itself usually takes about a week. Either way, the idea is “often as possible”. Awesome glad to hear it. I like the oxygen idea. It would add a sense of danger. Perhaps some areas under the planet’s surface are dark as well and require artificial light? You could also eventually add player hunger and thirst in as well if it made sense. The gravity idea is good as well, maybe some planets you float on but others are so huge you can’t even jump on because of gravity. The smaller, easier to traverse on planets would be good for beginners whereas the large and hard to traverse planets are richer in resources. It would be cool to add some kind of rope or crane that your ship can pick things up with and drag around as you fly. This way you can have missions to move stuff in a certain amount of time or if you are an explorer you can move things that are too big to carry back to your base. Even steal things from other civilizations. I love Wallaby’s dark area idea, maybe a light in the font of the rocket and a rope or crane in the back. I would also like to pick to be an alien or a human (astronaut). It would be cool to place flags down too, like we did on the moon, so if you saw someone elses flag you can decide if it is friend or foe. Yes! Little missions to pickup and carry cargo would be really fun! Especially in a multiplayer mode against another player over wifi. I really like the flag ( markers ) idea also! Thanks, Mike! Perhaps the missions could be initiated by randomly located friendly AI characters that you can chose to help and interact with or simply destroy for resources. Speaking of multilayer over Wifi, it would be cool if you could explore your friends world and either help him or steal from his world or bring stuff from your world to his. You know, I think you should make the app available for $1 now. I love the idea and I think its worth funding. I think most people would actually. It’s such a unique strategy. Love it. Maybe segment two apps into different upgrade schedules? I agree with Wallaby that a minecraft-ization is very appealing. And MWildermuth’s multiplayer over wifi is great. I’d love the ability to upgrade the rocket. this is so fun!! Hey, this concept was written in my idea list Bryan! Anyway I’m glad you do it, that’s an interesting experiment, that will require a lot of work. Keep it 0$ while there is nothing to play, you can start to think upgrading the price when you reach 1M free downloads. Really nice feeling for the controls. The portrait mode seems to be better suited for the way the ship moves. - Avoid hazards and ennemies. - Map miniature with red points for hazards/enemies and green poins for objectives. - Fuel management (?) with fuel stations. First of all, I really like the Concept of using Community ideas to develop a game. It would also be a lot of fun to “unlock” different ships, which would be controlled differently, for example a battleship could be controlled like in a Dual Stick Shooter. which you have a huge map, maybe even consisting of multiple planets, in which you find upgrades to reach a path you couldn’t reach before. Wow! Thanks for all awesome ideas guys! I did not expect this much interest so soon! 1. Little space man who gets out of the ship that you can control. It seems that everyone wants to get out of the ship and this will setup a base to build more mechanics off of later on. 2. Dynamic lighting from a light at on your ship. I think this will give everything a really “cavey” feel ( that’s not a real word! ). If all goes well, I’ll try to submit that as an update in the next few days! Ok, off to work! Tonight I code! Hello there, I can just agree, this concept is awesome. I also like the idea of visiting planets ans space stations. My suggestion would be that one can create and terraform these planets and have like a home planet. Also, there could be other alian species you can interact with. Visiting their planet, for example, could give possibilities for trading, and with new goods you can explore new stuff etc… There could be extras and new “alian-tech” to gain, so one can improve the home planet. What is really good so far are the graphics – marvellous! Though, sometimes the ship gets stuck when hitting rocks above. The flight physics are sweet, too, as well as the spaceman-thing. If you decide on using a kind of level based approach in this, it would be awesome to Release the Level editor so people can experiment with it and find bugs etc. What kind of “update Code names” do you mean? I think it would be really cool if it was possible to get out of your ship and of course there would be bad guys and you had a blaster. It would also be cool if you could find a object of some sort. And, it would be awesome if you could change the thruster/exhust/fume color that comes out of the back to some thing like blue. You know what else would be cool? If you could be to like a ‘highway’ where you could talk to other spaceships and they could talk back. That would be really cool becuase you could have this cleared out area where there is like 10 or 20 space-ships flying around talking and stuff like that. 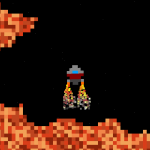 You could also make and arena where there are two space-ships and they try to shoot the other one down. And you could level up and stuff like that. I hope that you like these ideas!! HEY!!!! YOU COULD ALSO MAKE GAME CENTER SUPPORT AND MAKE SOME ACHIEVEMENTS!!! I had an idea that everyonce in a while the planet that you were on would kinda like get into the orbit of another and gravity would change to another side of the screen. Another thing that i love about other apps i’ve played is crazyness and creativity. In tilt to live the enemies could transform into differnt weapons and it was fun to see what they’d do. Or like in the game Eliss where sometimes you have 5 fingers on the screen playing. That was really funny and entertaining. These are all GREAT ideas, guys! Keep them coming! My idea is implementing something similar to Minecraft with an RPG level system. 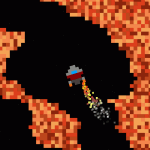 For example, your rocket can fire lasers that can dig for resorces. As you play, the laser progressively improves. These resources could then be used to create a sort of home base. Again, I love this game’s concept and am sure that it has a bright and fun future ahead. To sort of establish a story, there should be satellite like things floating about. I was going to suggest a little man; but I’m glad to see you’re already implementing it. Anyways, you should have to disembark from the ship and touch the satellite with your little man. He would then get part of some kind of transmission. 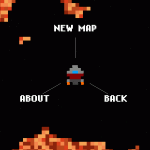 You could have goals to collect all of the messages, and discover why the Astronaut is just floating about in the first place, and the history of the area you’re in. Each transmission could have a different military designation (for example: Alpha Whiskey Charlie could be one) which would be used to identify it. They would be just one or two sentences and contain a lot of open ended information to let the user make assumptions that fit him or her. It’d be really neat if it were something dark and dead space esque. @Coops58: Neat idea on touching the satellites to get missions / story / information! I really like that! Thanks! You know, you really should implement a duck named Joe into the game somehow. That would be really, really, really, really(x33), funny! Wahoo!! Thank you!!! That will be so awesome!! I’ve been playing for a while now and i noticed that it’d be cool if there was a kind of mini map. switching to the big one gets kinda “difficult” after some time, so a mini map would be a great help. You mean something different from the mini-map that’s already in the game by pressing the magnifying glass? yes yes thats what i mean. something that shows just a part of this big map and whats like in the upper left corner constantly so you can always see what direction you are going without changing to the “magnifying glass map”. A Metroid style mini map would be cool. Like as you explore the world, more of the map is revealed based on where you have been, but you have to discover it on your own. I agree Terry, I struggle to see the gold too, maybe the gold could have a glint effect? or just be a different colour.